Most tourists don’t know that is it possible to make a complaint about bad or inedible food in a restaurant. But even here you are basically concluding a contract, which must be fulfilled. And if not, you have every right to say something. In cooperation with the consumer organization dTest, we are bringing you a few tips regarding what to do with over-salted soups, long waiting times or cold meals. “It is practically possible to make a complaint about anything that is the subject of a contract that you close with the restaurant owner – we will be speaking mainly about serving food and beverages. The problem can be in the amount served, temperature, composition, preparation method or taste,” says Lukáš Zelený, the leader or the legal department of dTest. “There should be no discussion regarding serving you another meal, if they served you a different one in the first place. But you cannot finish it first and then ask for the original order with an empty plate,” he adds. The served meals and beverages must fulfil certain conditions, be it in their content, which is listed in the menu, or in the way they should be prepared according to your wishes. In case any special wishes have been made, the meal should correspond to the usual nature of this meal – meaning that you can’t be served sausages when you ordered tenderloin, or that you can’t be served cheap supermarket lemonade, when you ordered a high-quality one. Food and beverages must be served in the amounts specified in the menu. With beer, you can only determine the correct amount after the foam has dropped. It is possible to complain about the temperature as well – for warm meals, it has to be at least 60°. The chef can heat a cold meal up. But if this step would alter the meal, you have the right to ask for a new one. Should you have doubts that the bill does not correspond to the prices listed in the menu, make a complaint. “Always check if the prices correspond to the prices in the menu. The bill must not contain fees that you were not warned about before, or more precisely, you are not obliged to pay such fees,” warns Zelený. The same applies to the tips. Don’t excuse waiting too long either. “In case of long waiting, you can ask for a discount, or simply step away from the contract and leave. If the preparation time is listed in the menu, or if the server informed you about it, the restaurant must not exceed it. In other cases, the preparation must correspond to the complexity of the order,” adds Zelený. If you are unsatisfied with something in the restaurant, inform the server right away. It is hard to complain about something that you have eaten completely. It is definitely worth behaving politely and calmly, and describing as accurately as possible what you do not find satisfactory. A cold soup or forgotten ketchup doesn’t have to be a reason for a drama scene. 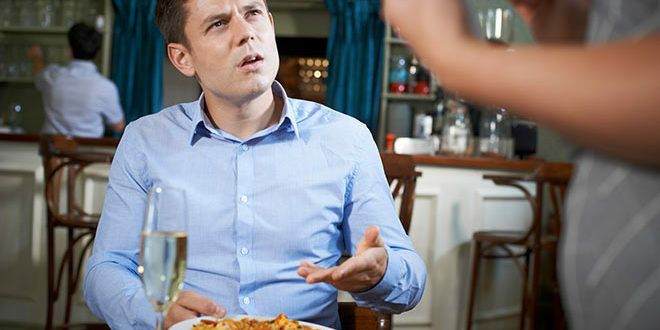 If the waiter is reluctant, ask for the person responsible for any complaints made – there must be one in every restaurant. “You always have the right to receive an adequate discount. Or you can ask for other solutions, such as further cooking the meat or asking for a new meal altogether. In case of severe problems that cannot be easily corrected, you can step away from the contract – meaning you can leave without paying,” says Zelený. In case of obvious and measurable insufficiencies, the service staff will not usually argue with you. Cases regarding consistency or tastes are more complicated, as opinions can differ and you may not be successful with your complaint. Then you will have no choice but to avoid this restaurant next time, or to give it a negative rating. You can also inform some of the state supervisory organizations. Deficiencies pertaining to the amounts and measurements of the served meals and beverages are dealt with by the Czech Trade Inspection Authority, and regarding food hygiene you may turn to the Czech Agriculture and Food Inspection Authority or the State Veterinary Administration.